After last week’s article, it seemed like the least I could do to visit the new monument. I’d seen pictures of it, but you know me. It’s not enough to know it exists; I have to see it with my own eyes. Flying back to Immensea after what we’d just experienced, though, wasn’t exactly high up on my list of things I wanted to do. Travelling solo through null sec still gives me the sweaty palms and knotted stomach. Also, jumping into a Razor-filled B-R, after the song I’d just released, was like begging to die. Maybe it was . . . but I didn’t. Die, I mean. Not this time, anyway. I went to B-R5RB by way of Poinen, where I had a Cheetah stashed. I was already in Jita, anyway, awaiting the announcement of a different monument. It seemed like a good idea at the time, but 38 jumps in one direction can grate on the nerves. I pretty much autopiloted my way to Keberz while reading a book, so it wasn’t so bad, but once I jumped from Keberz to HED-GP, it was time to pay attention. I honestly didn’t care if I died on the way back, but I needed to make it there. The route in was mostly empty, save for a fail SOLAR Sabre and a few of his friends. Even with the two bubbles they dropped for me, the six of them didn’t catch me. I got away quite easily that time. I was definitely more cautious after running into them, warping to safes and constantly checking D-Scan. You know– like you’re supposed to do. It took a little less than an hour to get to B-R. Once I jumped in and saw that giant wall of red and orange in local, I starting getting worried. 76 people in local and only 2 of them, myself and Sort Dragon, weren’t CFC. This didn’t make me feel very good about coming alone. No camp, just bubbles, all of which were in line with the outgate, which made me wonder just how many people warped straight to the beacon from the gate. C’mon, guys, play smart! The monument looked, predictably, just like every other monument in the game, but it didn’t feel the same. The robed figure pointing his finger of blame, along with the description that had just popped up on the screen and the carnage that surrounded me, made the whole place feel heavy. Distressing. I set about my task of taking screenshots to document the stark, desolate beauty of Titanomachy, marveling at the attention to detail. 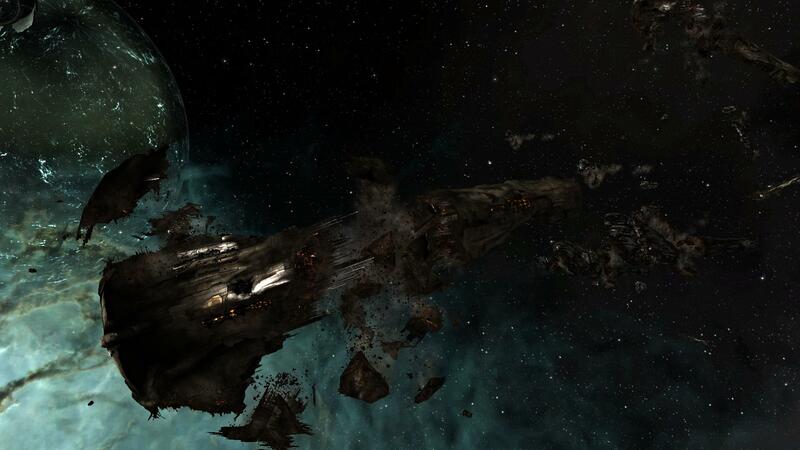 Even in a game as rich and gorgeous as Eve Online, this tribute was awe-inspiring. By being able to see every piece of the wrecks – some no larger than specks of dust, blurry across my screen – let every visitor feel just how enormous this fight was. There were pieces everywhere. I couldn’t gaze anywhere in the general vicinity without seeing chunks of hull, billows of smoke and great, jagged shards of metal. 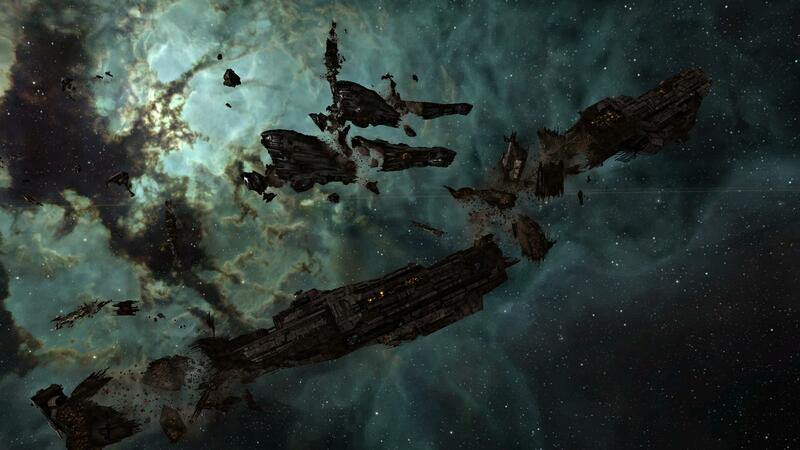 People who’d never played Eve would be impressed by the enormity of the titan graveyard. People who had fought in the great battle would find it a fitting resting place. People like me could, once again, only look on in amazement, wondering what a fight of such magnitude must have felt like. 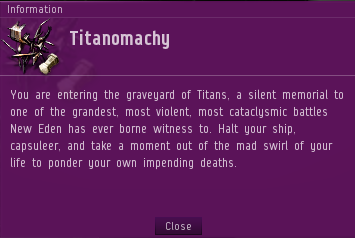 With all of CCP’s talk about focusing on the future, they definitely got this right; years from now capsuleers will travel here and muse about what happened, hearing only second-hand stories and legends of dancing skeletons. After spending the greater part of an hour taking a bunch of screens, I decided it was time to leave. But how do you leave a place like this without acknowledging you’d been there? An idea blazed through my mind and I knew what I could do. I’d leave a can, just as I did at Eve Gate, just as I did at Molea. Not just any can, either. I dropped my cloak and jettisoned the greatest can ever, containing one of my most prized possessions, something I hold very near and dear to my heart: one perfect Exotic Dancer, Male. I set the name to simply read “RIP Titans”, cloaked back up, and started the journey back home. The way back was exponentially more exciting and nerve-wracking than the way in. In addition to the same Sabre (three damn bubbles this time, and he almost caught me, coming within 2600m), I also met a fleet of Darkness of Despair carriers, a 20-man SMA fleet, 4 gate camps, and a fellow by the name of Lazarus Sharp, who I’d swear was following me around just to drop my song lyrics in local. When I reached LXQ and docked, three hours after I’d left, I was relieved. Sure, I felt better knowing that I’d taken the time and the risk to go see this beautiful place, but it was nice to be home – even if home is currently in Etherium Reach. I highly recommend making the pilgrimage to see Titanomachy. It is one of those places in New Eden that every player would appreciate, and that every player should see at least once.